To celebrate our baby, who is due to arrive in about one and a half weeks, we had the loveliest barbeque given by our neighbors. I had to show some photos of the darling cake and cupcakes that they created! You might remember my neighbor, Toni, who helped me make wedding shower and baby shower cookies. Well, this cake is her creation along with help from her husband and daughter. 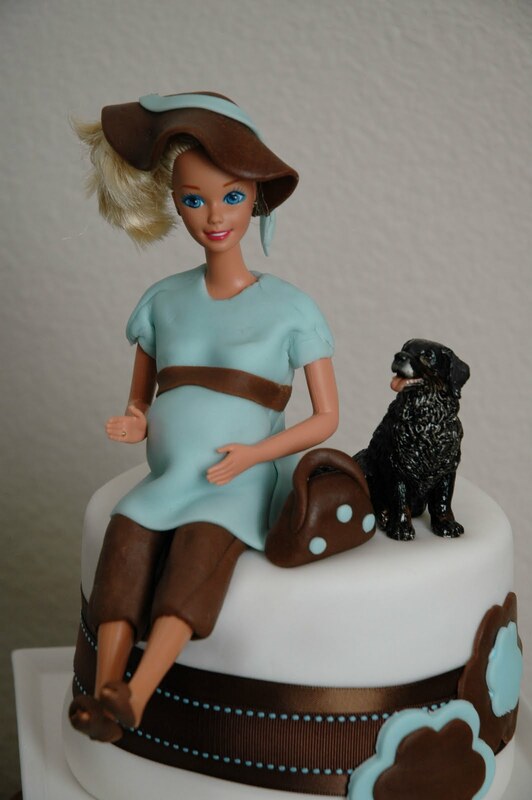 Just so you can appreciate all the work here, I have to describe what they did to create pregnant Barbie, as me, with our dog, Beaker. 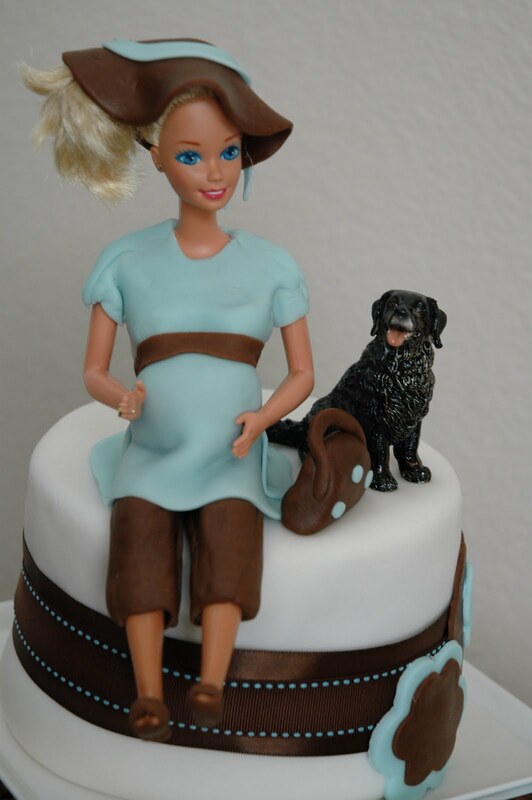 They made Barbie's clothes and baby bump from fondant! And because Barbie is actually too tall for the cake, they used a Skipper legs and torso so that she was in proportion for the cake. As for Beaker, our black lab, they found a figurine of a Bernese Mountain dog and used a bit of paint. She looks so cute! I love the little hat and purse as well! Justin wondered where he was and I told him "Shaving Fun Ken" was unavailable. 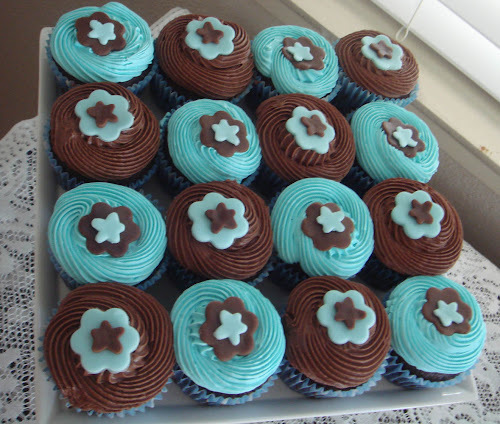 And I also have to mention these delicious cupcakes! They were chocolate with cream filling. Mmm, just what baby and mama wanted! 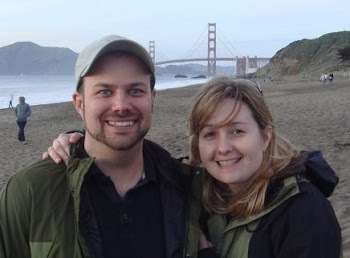 So, you'll probably see a slow down in posts with the arrival of our little guy but we'll try to post as much as we can. What fun and how creative. Love all of it! The details are what makes these kinds of cakes so great and they did a fabulous job. Thanks, Fran. It was really cute and so clever! 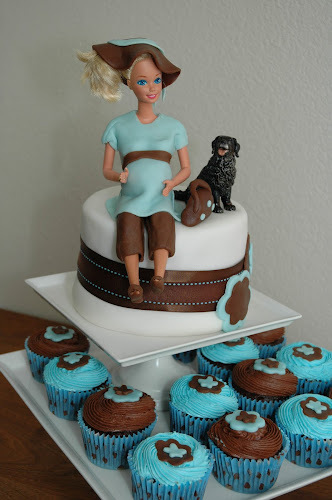 Creative and unique decorating ideas are shown through this baby shower cake design demonstrated here.To bring an awesome flavor to this celebration,diaper cakes are great addition. I just amazed with this type of crafts.